Advanced training takes place this Thursday night (September 27) for all Whangarei Clubs from 6pm-8pm at Whangarei Central Branch on Lupton Ave.
All 4th kup (Blue Belt) students and up are invited to attend. Training for lower grades is cancelled for this night. 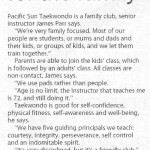 Our son Samuel, age 10 years, joined Pacific Sun Taekwondo 2 years ago. During this time, Samuel’s confidence, self-respect and discipline has improved greatly. He has also become a lot fitter and healthier. Thanks Pacific Sun! In the time my son Hamish has attended Pacific Sun TKD he has become more confident, is excelling in his schoolwork and understands to get better at the others he has to do extra work. In all honesty TKD has been the best thing for him at this time in his life. 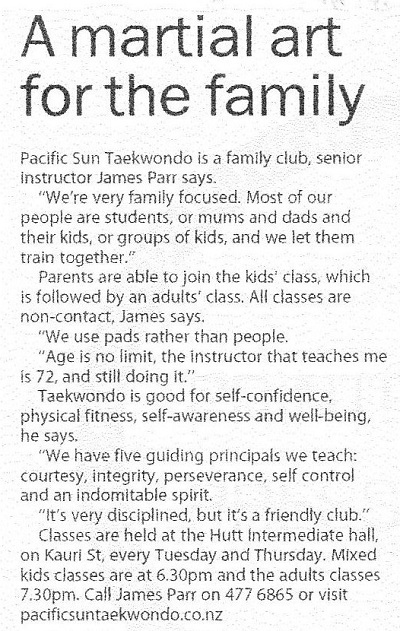 © 2019 Pacific Sun Taekwondo.